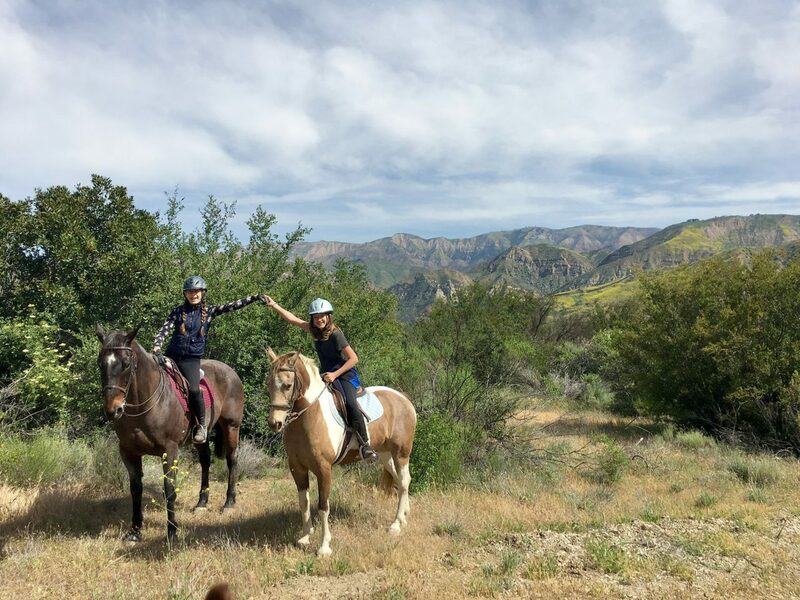 Ojai Valley School welcomes riders of all levels, from experienced competitors to beginners and purely recreational riders. Our instructors have experience in hunters, jumpers, equitation, dressage and combined training. 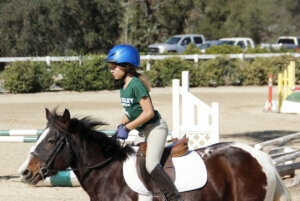 At OVS, riding is among our most popular middle school and high school sports. 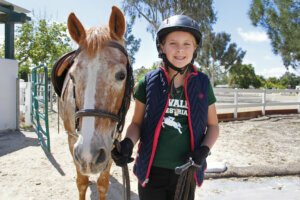 Ojai Valley School is one of the few equestrian boarding schools in California with stables on campus, allowing students to walk from class to the barn to ride nearly every afternoon in place of sports or P.E. classes. 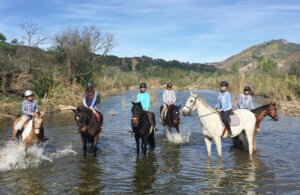 Students also have the unique opportunity to participate on equestrian camping trips to ride trails and cross streams in the stunning Santa Barbara back-country. Learn more by visiting our equestrian overview page. November 1 – This month, OVS equestrians will hit the trails for their first camping trip of the school year. Riders, horses and their instructors will explore the Santa Barbara County backcountry trails for three days and base camp in the evenings. 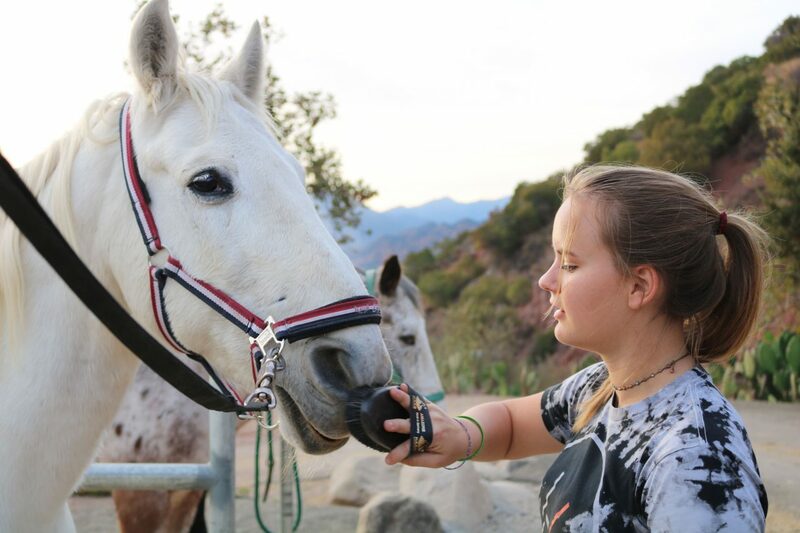 Ojai Valley School is one of the few equestrian boarding schools in California with stables on campus, allowing middle and high school students to walk from class to the barn to ride nearly every afternoon, in place of sports or P.E. Students find numerous opportunities to improve their riding skills in a program that emphasizes athleticism, horsemanship, patience, compassion, perseverance, and hard work. Students begin riding in prekindergarten and continue riding once a week through third grade. They then have the option to continue riding in place of P.E. or a sport through 12th grade. As a United States Pony Club Riding Center, OVS gives students the opportunity to earn their Pony Club certification, as well as to ride with the OVS Competitive Team. With a highly experienced staff and barns and arenas at both our Lower Campus (PK-8th grade) and Upper Campus (9th-12th grade), OVS welcomes students of all skill levels. Outdoor camping trips are part of the riding experience. In October, guest instructor Paul Belasik led a dressage clinic at Upper Campus, providing seven young riders the opportunity to hone their skills with an accomplished author and horse trainer. Mr. Belasik gives clinics, lectures, and demonstrations internationally as well as working with students at his Pennsylvania Riding Academy. OVS equestrians have enjoyed a busy month of events. Four middle school riders attended a competitive jumping derby in Somis, coming home with several top-place ribbons and horse show experience to launch the year. Elementary riders gave a demonstration during Family Weekend at Lower Campus. And high school riders will head out on their first horse camping trip of the year in November. 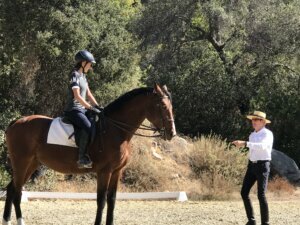 The Ojai Valley School equestrian program gives students in grades 4-12 the opportunity to ride horses as their sport and compete as members of a school team. Our program welcomes riders of all levels, from experienced competitors to beginners and purely recreational riders. Our instructors have experience in hunters, jumpers, equitation, dressage and combined training. Students also have the unique opportunity to work with guest instructors, including jumping coach Don Sachey, dressage instructor Paul Belasik, and our own OVS alumna Tiana Coudray, who visited after her appearance in the 2012 London Olympics. 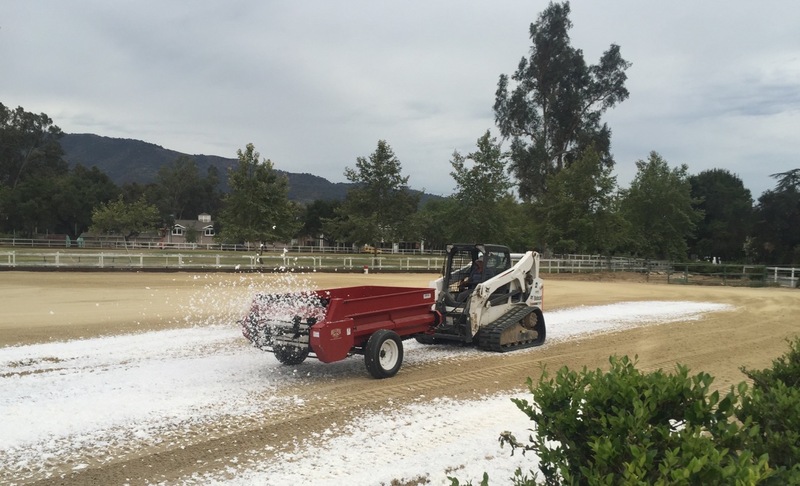 As the mercury hit 90-plus degrees this summer, a thick layer of fluffy white material blanketed the equestrian arena at Ojai Valley School and left the distinct impression that it had just snowed. In fact, the material layered across the riding arena at the Lower Campus was part of a significant water-savings project launched by the school to replace fine sand with a state-of-the-art irrigation system and new geotextile footing material that is expected to dramatically cut the school’s water use, saving about 500,000 gallons of water a year. The move is directly in response to the ongoing California drought and continues the school’s commitment to environmental sustainability. It is also a significant improvement for the school’s renowned equestrian program, as few schools or boarding stables have embraced such conservation measures. Three years ago, OVS installed a 1,001-panel 274-kilowatt solar array that produces more than 95% of the electricity at the Upper Campus. For more than a year, food waste from the dining hall at the Lower Campus has been composted through a partnership with Harrison and Sons. More recently, the school has begun the process of converting lighting fixtures to LED and installing high efficiency HVAC systems. It has also taken dramatic steps to reduce its water use on both campuses, replacing grassy areas with mulch and drought-tolerant plants, installing weather-based controllers, and optimizing irrigation. Perhaps the most visible project for the greater Ojai community is what the school has done at the Lower Campus equestrian arena – removing fine dusty sand and replacing it with the new footing made from a mixture of quartz sand and polyester and synthetic materials. Historically, water reduction has presented a challenge for the equestrian program due to the need to mitigate dust created when elementary and middle school students ride in the arena. In accordance with an Ojai city ordinance, the dust must be kept to a minimum for safety and that has traditionally been accomplished by watering the arena. Several months ago, Equestrian Director Stephanie Gustafson began researching alternatives to further minimize water use while maintaining a safe and healthy environment for students, horses, staff, and the broader community. 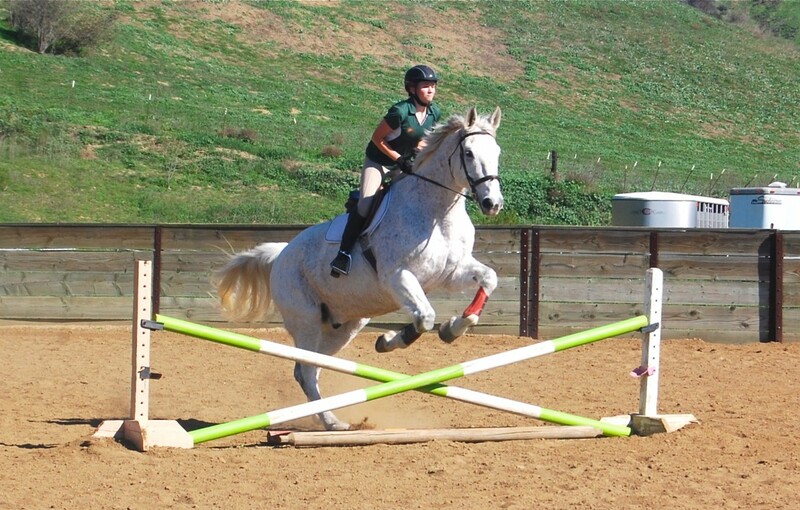 January 31 – Ojai Valley School equestrians in grades 5-8 passed their examinations for higher ratings within the U.S. Pony Club on Saturday, demonstrating their skills at stadium and cross country jumping while enjoying a beautiful day riding together in the hills north of Ventura. Supported by friends, family members and their OVS instructors, six riders rode Saturday at the Canada Larga Ranch stables for their D-2 Pony Club certifications. 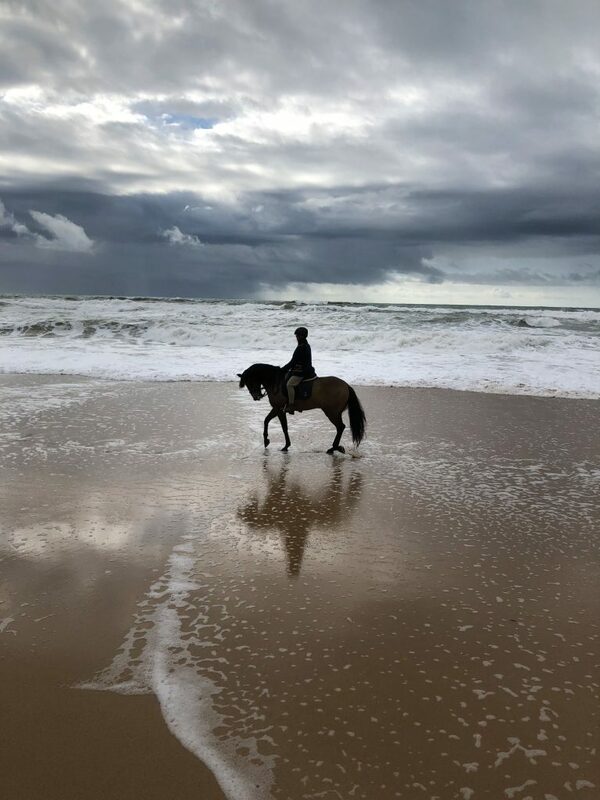 They first demonstrated proficiency in horsemanship and the care of their horses, then ride on the flat and over fences in the arena before venturing out to the cross country course developed by stables owner and OVS past parent Steve Gaggero. The girls showed poise, courage, teamwork, and perseverance while also having fun riding in a new setting that presented challenges for the horses and their riders. OVS high school equestrians will have the opportunity to train at Canada Large and take their certifications in March. Thank you to the Gaggero family for hosting OVS at these events. To view photos from this equestrian event, please visit the Images of OVS page. Click the enclosed link to see a calendar of Upcoming Equestrian Events.